Wardington is a village and civil parish in Oxfordshire, about 4 miles (6.4 km) northeast of Banbury. The village consists of two parts: Wardington and Upper Wardington. The village is on a stream that rises in Upper Wardington and flows north to join the River Cherwell. The parish includes the hamlet of Williamscot, about 1 mile (1.6 km) southwest of Wardington. The parish is bounded to the west and north by the River Cherwell, to the south by a stream that joins the Cherwell, and to the northeast by field boundaries. Its northeastern and southern boundaries also form part of the county boundary with Northamptonshire. The 2011 Census recorded the parish's population as 602. The Domesday Book of 1086 records Wardington as part of the Cropredy manor of Remigius de Fécamp, Bishop of Lincoln. 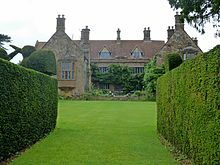 Between Lower and Upper Wardington is Wardington Manor house, which dates from the middle of the 16th century or possibly earlier. The house was remodelled in 1665 and twice early in the 20th century. From 1917 Wardington Manor was the seat of Baron Wardington. In 2004 the house was severely damaged by fire but it has since been restored. It is a Grade II* listed building. The Church of England parish church of Saint Mary Magdalene has a 12th-century chancel and 13th-century nave. In the 14th century new Decorated Gothic windows were added to the chancel. In the 15th century a Perpendicular Gothic clerestory was added to the nave and a west tower was built. Monuments in the church include two 14th-century tomb recesses and a 14th-century slab with a foliated cross. There is a 15th-century monumental brass to Henry Freebody, who died in 1444. In the south chapel is an 18th-century monument to George Denton, who died in 1757. The church was restored in 1887 and 1889 under the direction of the Gothic Revival architect Ewan Christian, and again in 1912–14 under the direction of WT Loveday. St Margaret's is a Grade I listed building. The tower has a ring of six bells. Henry I Bagley of Chacombe cast the oldest in 1669, Henry II Bagley cast the tenor bell in 1682 and Henry II and Matthew I Bagley cast the treble bell in 1685. John Briant of Hertford cast two more of the bells in 1791 and 1795. John Taylor cast the youngest bell in 1841, presumably at his then foundry in Oxford. St Mary Magdalene parish is now part of the Benefice of Shires' Edge along with those of Claydon, Cropredy, Great Bourton and Mollington. A congregation of Wesleyans was established in the village by 1815 and had built a chapel by 1827. In 1895 a larger chapel was built in a Gothic Revival style next to the old one, which was sold to the owner of the manor house. The chapel was part of the Methodist Union of 1932, and was still open as part of Banbury Methodist Circuit in 1964. It has since closed and been converted into private homes. In 1469 in the Wars of the Roses the Battle of Edgecote Moor was fought near Wardington. In 1644 in the English Civil War the Battle of Cropredy Bridge was fought across the parishes of Bourton, Cropredy, Prescote and Wardington. The site is now on the Register of Historic Battlefields. Williamscot House is Elizabethan, built for Walter Calcott in about 1568. A Queene Anne style wing was added in 1704 and extended in Georgian style in 1777. The Elizabethan part of the house is now Grade II* listed. From 1574 Wardington was served by the Free School northeast of Williamscot House. The Free School was closed in 1857 but the building survives. By 1833 a school had been established at Wardington itself. This became a National School and acquired its own purpose-built premises in 1845. After 1947 it became a primary school, with children older than 11 being schooled in Banbury. The school was closed in 1991 and is now a private house. In 1753 Lower Wardington had three public houses: the Green Man, the Hare and Hounds and the Wheatsheaf, also called the White Swan and the White Lion. The Green Man seems to have ceased trading by 1787. In 1966 Upper Wardington had two public houses: the Plough and the Red Lion. Today only the Plough and the Hare and Hounds remain in business (see below): the others have become private homes. In 1900 the Great Central Railway's branch line between Culworth and Banbury was built through the southern edge of Wardington parish. In 1911 the railway opened Chalcombe Road Halt more than a mile south of the village on Wardington Road. British Railways closed the halt in 1956 and the line in 1966. Wardington Memorial Hall was built in 1920 as a monument to members of the village who were killed serving in the First World War. Wardington has only one public house, The Hare and Hounds controlled by Hook Norton Brewery. The Plough was developed as a private residence in 2017 and is currently on the market. Wardington Cricket Club plays in South Northants Cricket League Division Two. The A361 road runs through Wardington, with some sharp bends where there has been a number of crashes. Northamptonshire County Council's Transport Prioritisation Framework includes plans for an A361 bypass of Wardington, Chipping Warden and Byfield. Since 2011 Stagecoach in Oxfordshire has operated bus route 200 between Banbury and Daventry via Wardington, running hourly from Mondays to Saturdays. There is no Sunday or bank holiday service. Until 2011 Geoff Amos Coaches of Eydon had run a Monday to Saturday bus service between Rugby and Banbury via Daventry and Wardington. In April 2011 Northamptonshire County Council reduced its English National Concessionary Travel Scheme payment to bus operators from 53 pence to 38 pence per passenger and Geoff Amos Coaches warned that this would threaten the viability of its bus services. On 4 August 2011 Geoff Amos Coaches announced the withdrawal of its scheduled bus services with effect from 5 August until further notice. 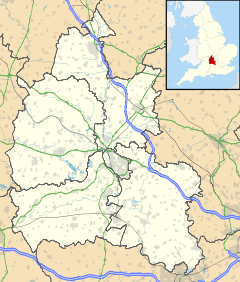 ^ "Area: Wardington (Parish): Key Figures for 2011 Census: Key Statistics". Neighbourhood Statistics. Office for National Statistics. Retrieved 16 February 2015. ^ a b c d e Crossley 1972, pp. 210–225. ^ Sherwood & Pevsner 1974, p. 823. ^ Historic England. "Wardington Manor (Grade II*) (1228757)". National Heritage List for England. Retrieved 16 February 2015. ^ Sherwood & Pevsner 1974, pp. 822–823. ^ a b Historic England. "Church of St Margaret, High Street (Grade I) (1228671)". National Heritage List for England. Retrieved 16 February 2015. ^ a b c Dovemaster (25 June 2010). "Bell Founders". Dove's Guide for Church Bell Ringers. Central Council for Church Bell Ringers. Retrieved 5 August 2011. ^ a b c d Davies, Peter (24 January 2007). "Wardington S Mary Magd". Dove's Guide for Church Bell Ringers. Central Council for Church Bell Ringers. Retrieved 5 August 2011. ^ Archbishops' Council (2010). "Benefice of Shires' Edge". A Church Near You. Church of England. Archived from the original on 5 October 2012. Retrieved 5 August 2011. ^ Sherwood & Pevsner 1974, p. 822. ^ Foard, G; Partida, T (May 2005). "Battle of Cropredy Bridge". Battlefields Trust. Retrieved 16 February 2015. ^ Historic England. "Cropredy Bridge (1000008)". National Heritage List for England. Retrieved 6 July 2015. ^ a b Historic England. "Williamscot House, late sixteenth century range, Wardington Road (Grade II*) (1287374)". National Heritage List for England. Retrieved 16 February 2015. ^ Historic England. "Williamscot House, Georgian wing (Grade II) (1228090)". National Heritage List for England. Retrieved 16 February 2015. ^ Historic England. "Williamscot House, School House approximately 200 metres north west (Grade II) (1287353)". National Heritage List for England. Retrieved 16 February 2015. ^ "Hare and Hounds in Wardington". Our Pubs. Hook Norton Brewery. Retrieved 16 February 2015. ^ "Taming of a danger route". Banbury Guardian. Johnston Press. 8 November 2005. Retrieved 6 December 2009. ^ MRC McLean Hazel 2006, pp. 71, 73, 77. ^ "Banbury – Daventry Service 200" (PDF). Stagecoach in Oxfordshire. June 2013. Retrieved 16 February 2015. ^ "Appeal for cash to save bus service". Daventry Express. Johnston Press. 5 April 2011. Retrieved 5 August 2011. ^ "Confusion after buses stop running". Daventry Express. Johnston Press. 5 August 2011. Retrieved 5 August 2011. MRC McLean Hazel (2006). Northamptonshire Transport Strategy for Growth – Transport Prioritisation Framework. Northampton: Northamptonshire County Council. pp. 71–77. Sherwood, Jennifer; Pevsner, Nikolaus (1974). Oxfordshire. The Buildings of England. Harmondsworth: Penguin Books. pp. 822–825. ISBN 0-14-071045-0. Wikimedia Commons has media related to Wardington. This page was last edited on 28 February 2019, at 10:52 (UTC).